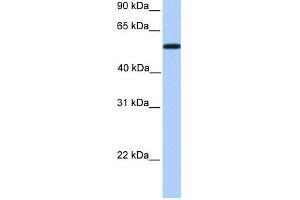 Characteristics This is a rabbit polyclonal antibody against UGT2A3. It was validated on Western Blot using a cell lysate as a positive control. Background UGT2A3 belongs to the UDP-glycosyltransferase family. UDP-glucuronosyltransferases catalyze phase II biotransformation reactions in which lipophilic substrates are conjugated with glucuronic acid to increase water solubility and enhance excretion. They are of major importance in the conjugation and subsequent elimination of potentially toxic xenobiotics and endogenous compounds.